795.00 EUR max. 3 Pers. 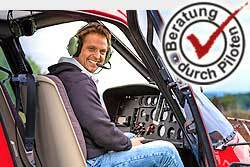 Enjoy a breathtaking helicopter flight with a stopover in Neuleiningen at Restaurant Sonnenberg, on the famous German Wine Route in Baden Württemberg. Perfect for a dinner or for a marriage proposal. There are the local attractions overflown according to the weather and desires of the passengers. The route depends on the weather and of course the flight safety, otherwise the pilot tried to fulfill your wishes in accordance with the flight time.